What did David do to calm King Saul's evil moods? As the impressive military parade passed the reviewing stand in Cairo last October 6, a man little known outside his native Egypt sat at Anwar Sadat's right hand. Hosni Mubarak, 53, had been Egypt's Vice President since 1975, yet few Westerners had ever heard his name. Even within Egypt Mr. Mubarak was something of an enigma. A powerful and influential personality, he worked in relative obscurity, behind the scenes- in the shadow of Anwar Sadat. As the fatal bullets tore into the reviewing stand, Hosni Mubarak's obscurity came to an abrupt and unexpected end. 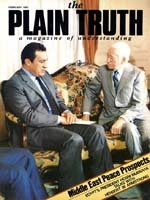 Anwar Sadat's protégé and handpicked successor was forced out of the shadows and catapulted into Egypt's highest office. The eyes of the world fell upon him. Who is Hosni Mubarak? What chain of events has led him to the pinnacle of Egypt's political pyramid?